Usually, it is caused by calling incompatible classes in themes, extensions or templates, database connectivity issues or resource shortage (i.e. insufficient diskspace or PHP memory_limit option). The Error log record number shown on the report is just a randomly generated filename, where the actual report data was saved to. Since Magento 1.4 version all error reports are dumped into files by default, rather than showing them right away in browser to every visitor. The report will provide futher information (it is just a plain text file), the first string in the report is the most important one. When you see the actual error message, you can look for the solution by narrowing down search results. If you recently installed some theme, try to switch interface to previously used theme or a default theme at System > Configuration > Design. If you can not reach admin interface, you can rename / move out theme directory under app/design/frontend/<theme_package>/<theme_name>, where <theme_package>/<theme_name> is path to your theme. 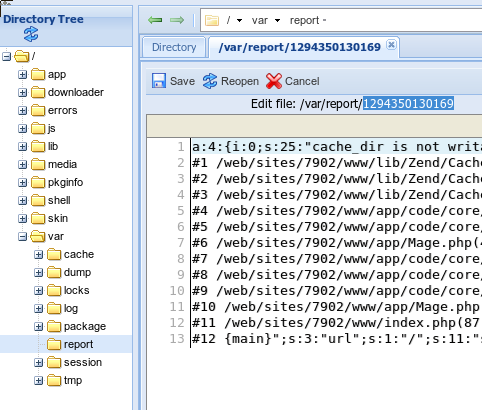 Flush Magento cache after each operation. Magento will switch to default theme if it can not find a custom one. If you host your store elsewhere: Contact your hosting support team for assistance, request details on possible errors or warnings logged in system log. If it still gives no clue, you can consider one of our plans to host your store, our support team should be able to import your store and fix all errors encountered.